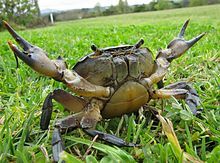 Potamonautes perlatus, the Cape river crab, is a species of crab in the family Potamonautidae. Potamonautes perlatus is found in South Africa, particularly in the Cape Province. There are unconfirmed reports that it occurs in parts of Namibia. Its main habitat is rivers, but it does occur widely in farm dams, where it often is regarded as a pest, with a propensity for digging tunnels in earth dams. It is doubtful that this is a serious problem in professionally engineered dams, but there may be occasional damage to small farming earthworks. Possibly because of its being primarily a river crab, when it lives in farm dams without direct connection to a stream, it has a tendency to migrate out of a dam during rainy periods, especially at night. It is not clear that losses from this habit reduce its numbers however, as its populations in stable dams seem to remain indefinitely. Ecologically the species often is quite important, as it is a detritus shredder, a predator of small fish and amphibians, and a major prey item for large fish, otters, aquatic reptiles, and various other animals. It also is an intermediate host to various parasites. ^ a b Neil Cumberlidge (2008). "Potamonautes perlatus". The IUCN Red List of Threatened Species. IUCN. 2008: e.T64389A12767481. doi:10.2305/IUCN.UK.2008.RLTS.T64389A12767481.en. Retrieved 9 January 2018. ^ "Wildlife and Biodiversity of Kirstenbosch". Kirstenbosch National Botanical Garden. South African National Biodiversity Institute. April 6, 2011. Retrieved August 23, 2011. This page was last edited on 24 June 2018, at 18:40 (UTC).